We partnered with Team Effort and Pastor Rob of Creators Fellowship in the Church Rock chapter in Gallup, New Mexico on this trip. Our students were given a glimpse of the beauty of Arizona and New Mexico; very different than that of the flat land of Florida. It’s good to take students out of their comfort zone and this trip did. 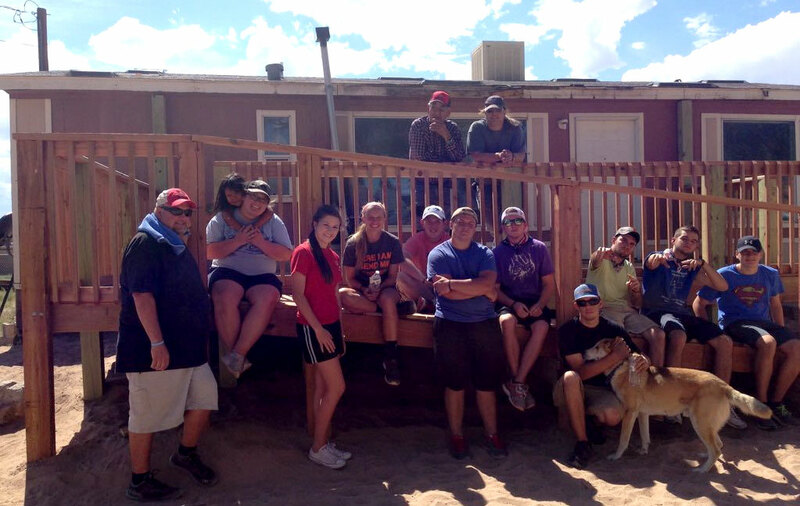 We were able to mix work projects with community outreach and do several Bible Blitz (handing our Bibles) stops around the reservation and the city of Gallup. Our biggest project of the week was to build a handicapped accessible deck with ramp for an elderly grandmother who had recently fell of the steps of her mobile home. Our students rallied around that project and honestly built the best looking deck I’ve seen. It became the talk of the entire Church Rock community. People wanted to know who and why those young people were working in their community. It opened the door for several more projects throughout the week including some flooring work on the church/community center Pastor Rob was involved with. We also replaced outside siding that had rotted away on a Hogan. Our evening worship and group time was filled with the Holy Spirit. God again provided an amazing trip for us. Our students not only blessed others, but they were blessed and grew in the Lord. I’ve been asked are these trips worth all the effort, work and fundraising. My answer is “They are worth every penny to see our students engaged in serving the Lord, growing their faith, and reaching out to others.” If we expect them to do the Lords work in the future we've got to train them now. Thanks to those who helped get us there this year and a special thanks to Grace Bible church who housed us on this mission. God will bless you for it.